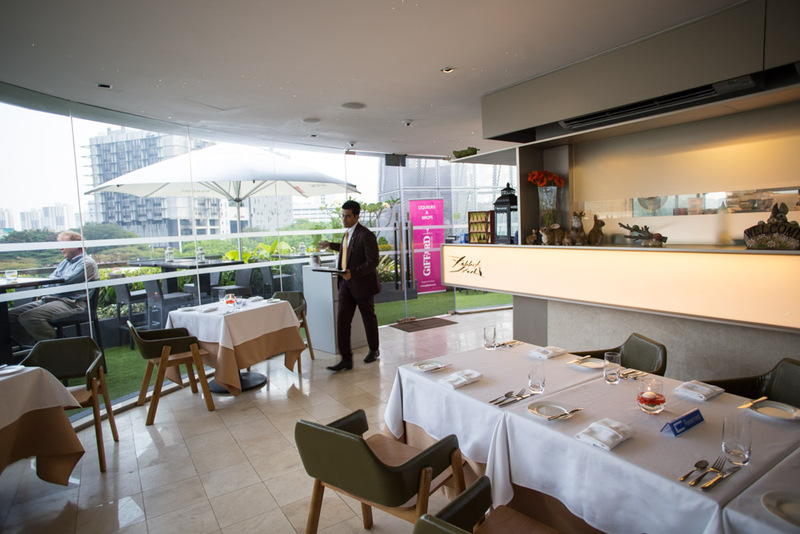 Replacing the former Halo bar at Wangz hotel, the Rabbit Stash has taken a huge leap from its former shop house unit within a condominium in 2011 to its new full restaurant space. The Rabbit Stash is started by Chew Matthew Mok, who was born in the year of the rabbit and hence bestowed its name. Although a master degree holder in Building Construction Management, he eventually switched over to a culinary career under At-Sunrise Global Chef Academy, which was much to his calling instead. 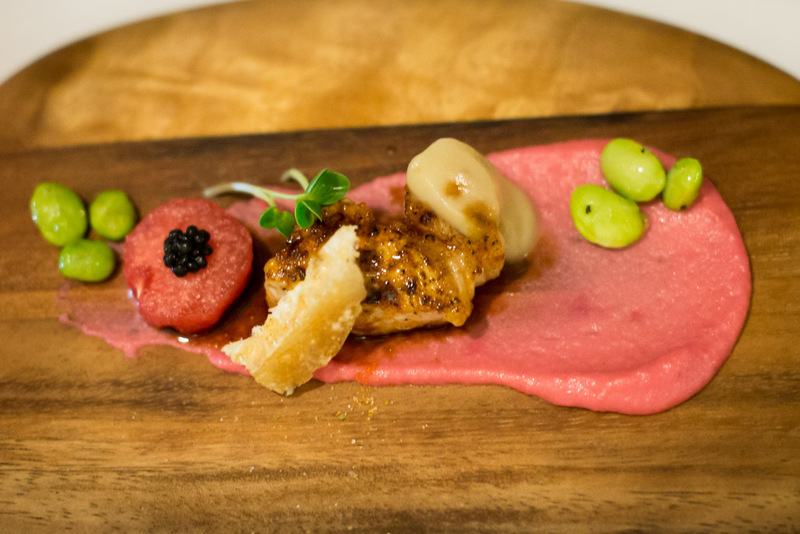 Chef Matthew believes his creations are like an art supper – a visual and gastronomic blend of art and food to tantalize the taste buds and senses. Adding a lot of his personal artistic touches, Chef Matthew has fully revamped the space into an intimate 30-seater indoor dining restaurant, formed around a semi-circle with floor to ceiling glass for ample natural light and a panaromic view of the city (although half the view is blocked by metal grills part of the hotel design). 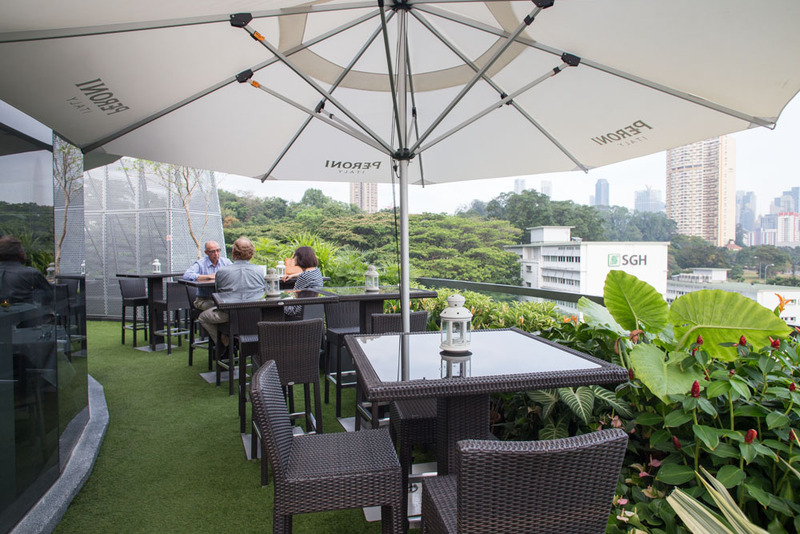 The outdoor terrace area seats 26 and is ideal for al fresco dining or casual drinks on the hotel’s balmy rooftop. 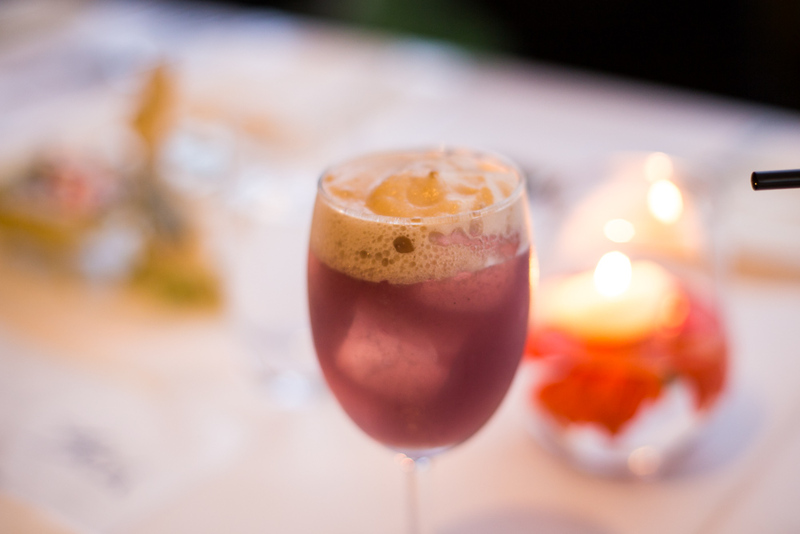 Today we’ll be trying Chef Matthew’s exquisite 7-course dinner menu ($148+), which is termed ENSOPHI – an acronym for Exotic, Nostalgia, Soil, Ocean, Pristine, Heritage and Impression. Each of these traits represent the poetic idea behind each dish served. We started off with an amuse bouche smorgasbord of miniature potatoes with mango and blueberry, lotus chips, yam jam, lime mayonnaise and butter flour chips all resting on top of bread and biscuit crumbs. There’s no strict rule on which starch goes with which dip, so let your imagination run wild with the various contrasting flavours. A small imaginative teaser for what’s to come. Soil. 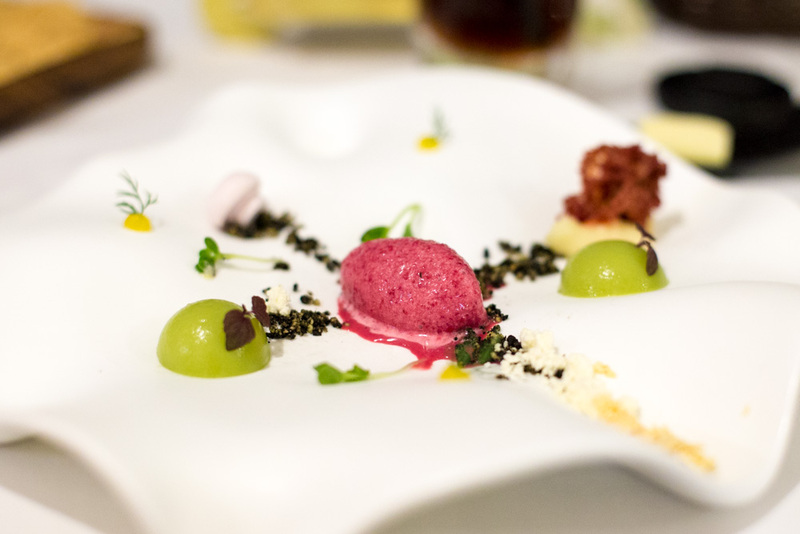 This beautiful plate consists of asparagus, beurre noisette (butter sauce), beetroot “mushroom” olive and basil snow. Each element is distinctly different yet is inspired by the greatness and abundance of our land to give a earthy first course. Pristine. Langoustine, cabbage dashi, 1st born egg, brown rice. 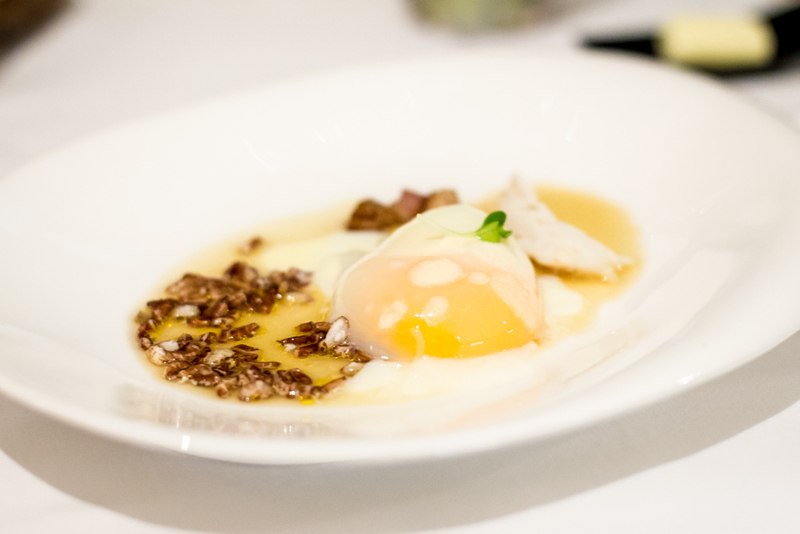 Using the chicken’s first-born organic poached egg, this dish is an attempt at being unadulterated to bring out the intrinsic natural flavours of each component, with just a simple dashi stock to bring the dish together without overpowering. Ocean. 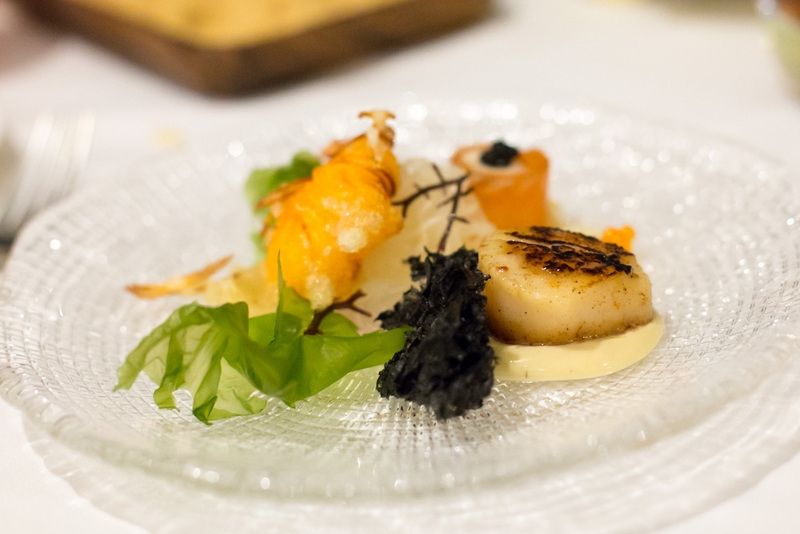 Scallop, black ink sponge, smoked trout, shrimp and chips. The shrimp is wrapped in a banana batter then fried, giving a unique tropical flavour reminding me of the bahamas. The colorful display of oceanic greens and algae also further enhance the overall look of this ocean-inspired dish. Nostalgia. 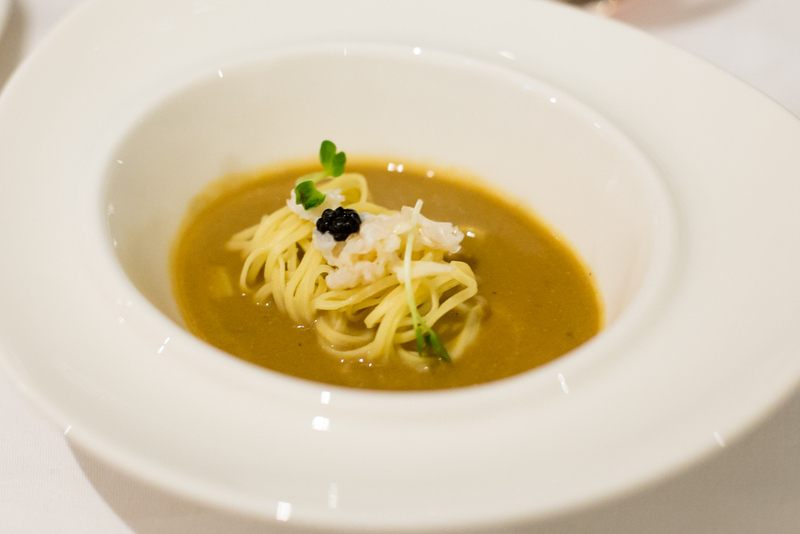 Purple crab, black roe, lobster broth with handmade noodles. Everyone has a different interpretation of how this dish prompts them of their past, but for me this reminded me of a nostalgic rich bowl of Mee Rebus I used to have in the school canteen. The texture of the broth is especially similar to the Malay Mee rebus, being a little thick and slightly grainy from the lobster shells although taste-wise couldn’t be more different. But the texture combination of broth and noodles really accomplishes its goal; one of my favorite dishes here. Impression. Berkshire pig, potato “mud”, watermelon. Driven by the impressions of the food, people and culture from his travels, Chef Matthew uses this dish to show the co-existence of the different animals, fauna, seasons and flora. Interestingly, this dish is comprised of ingredients that a pig eats (other than the pig itself of course). Heritage. 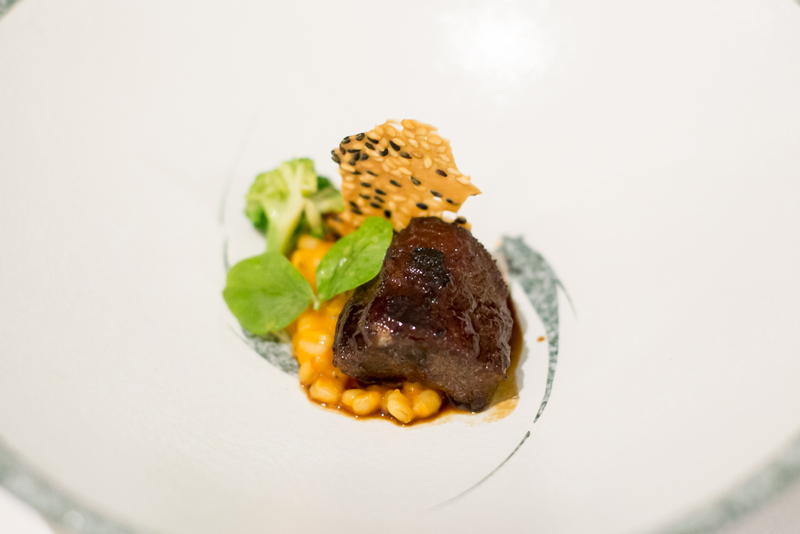 Beef jowl, barley porridge, sesame, red date. Recreating food that the chef himself grew up eating, this pays homeage to his roots and lineage with a tender beef jowl atop comforting barley porridge. Exotic. Mango fromage blanc, snow pear, green curry, rose. 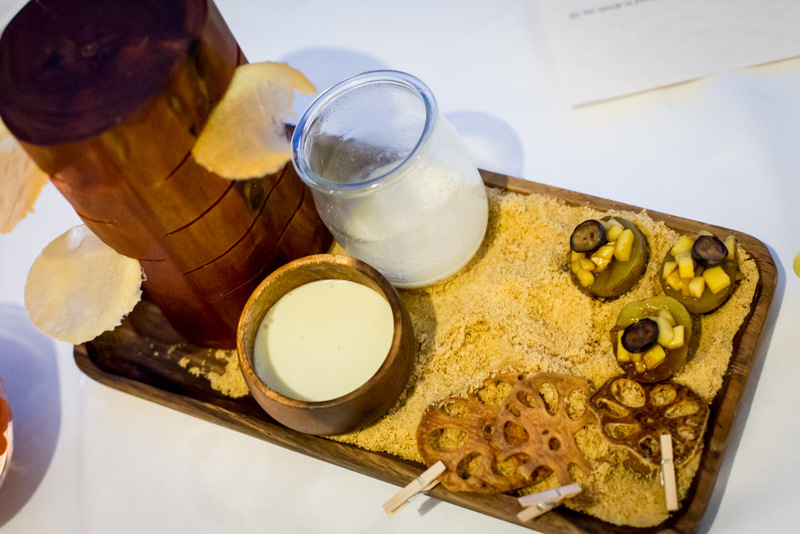 This is definitely the most unusual dish of the night, putting together green curry spices (from the ice cream) and sweets in one. With the addition of mango fromage (mascarpone cheese) into the mix, this is definitely not for everyone. 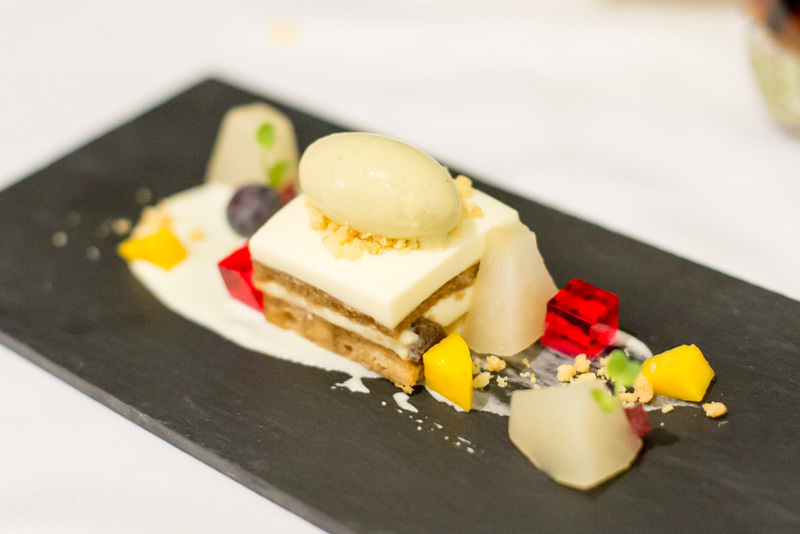 Still, this unique flavour pairing is the entire point of the dish; a challenge on creating the next revolutionary taste. 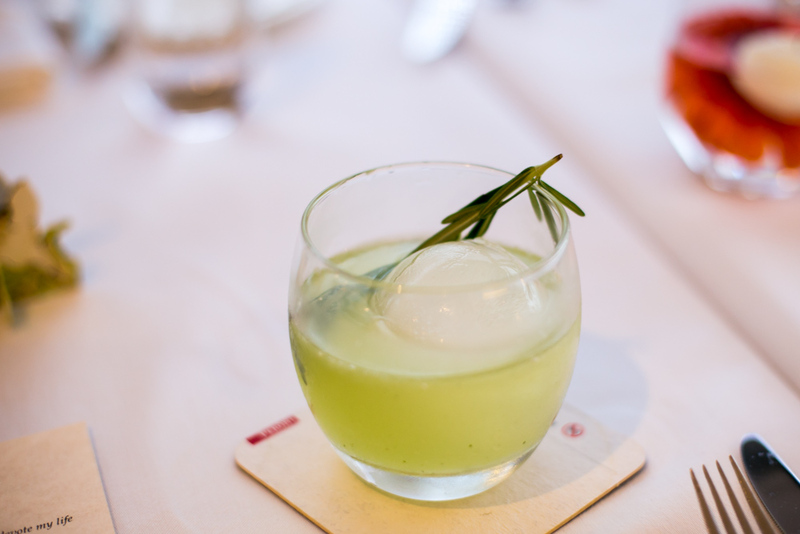 Resident mixologist Aidil shakes up craft cocktails that have a kick, while still being delicately balanced to pair with the food. Enjoy the live band that appears as well happening on Thursday to Saturday evenings. It’s the little things at The Rabbit Stash like the manager explaining every single dish and serving the ladies first that have impressed me and shown its caliber as a fine-dining restaurant. 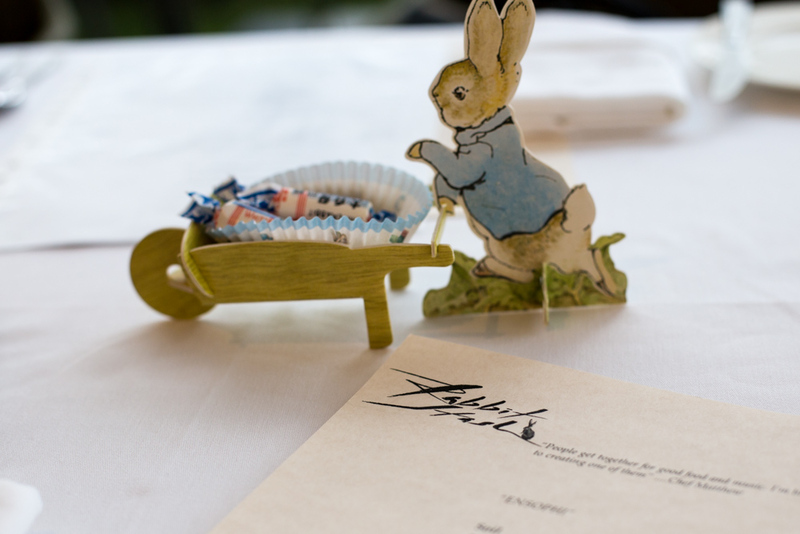 Although I’m not a huge fan of interpretive contemporary cuisines, much preferring the straight-forward grilled steak and such, The Rabbit Stash promises a magical gastronomical journey through Wonderland that guests looking beyond just food will appreciate.